We went on a blustery evening. The dinning room was full. Even though the wait was short we chose to sit in the bar. We were greeted with a Happy Hour that goes from 4- close every day. The Happy Hour menu looked great, but I was won over by the daily special. It’s the time of year for chanterelle mushrooms, so I am keeping an eye out for those dishes. Abella had one the night I was there. It was a spin on their Chicken Parmesan. It was the breaded chicken, with chantrelle mushroom gravy on top of mashed potatoes. Can you say comfort food? It was inredibly hearty. 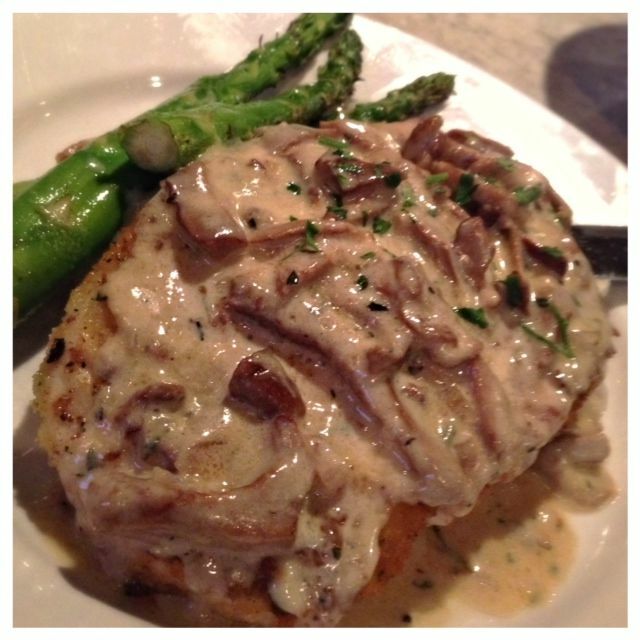 I loved the big mushrooms in the creamy gravy. It was served with fresh asparagus. It was a very large serving, but I cleaned my plate anyways. My husband got something much lighter. 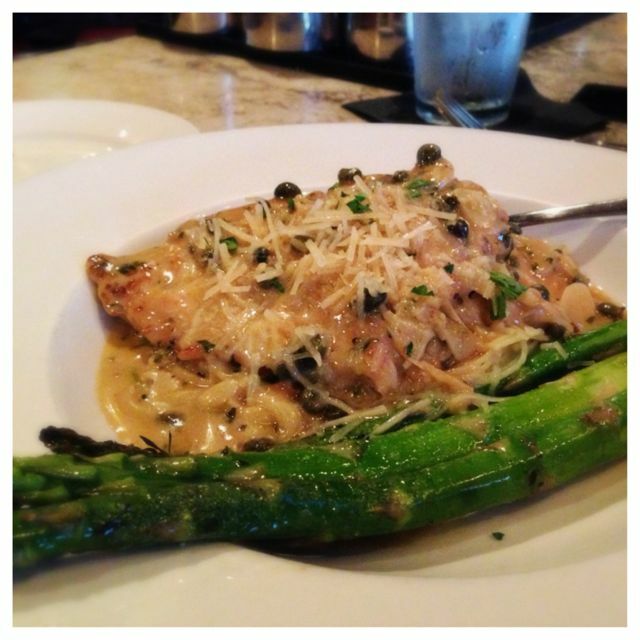 He chose the Chicken Piccata, which is the grilled chicken for a white wine butter sauce served over angle hair pasta. Not only is this dish lighter, but it has such a fresh pop of flavor that comes from the capers. His was also served with asparagus. 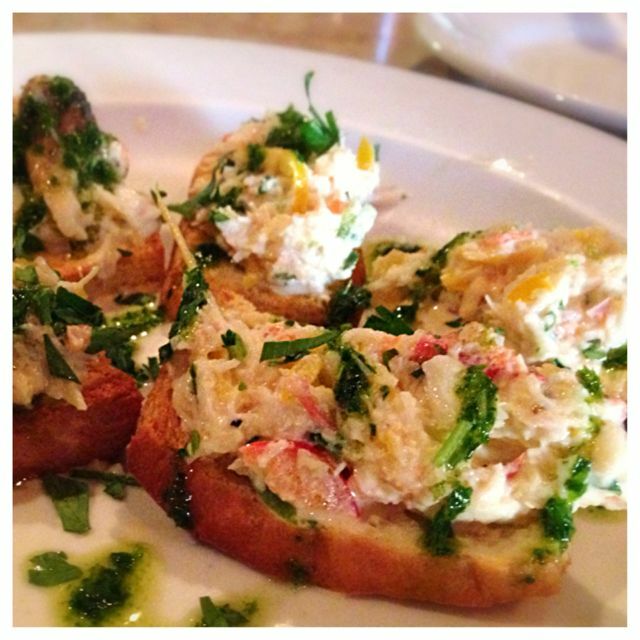 With all this food we probably shouldn’t have started with the Dungeness crab bruschetta. But we did and we loved it. The crab was lightly dressed and served with garlic aioli. It was a delicious appetizer and we have no regrets. Atmosphere is very inviting. It’s a nice romantic place, but they also have the space to accommodate large groups. Yes, it’s in a strip mall, but once you enter you immediately forget. Pricing is about $17-$18 on average. The servings here are very large. They have a great wine selection, a few beers on tap and cocktails. Abella is located in Wilsonville on Main St. This place has always worked for me. Great lunch too and a good value for the buck. That chanterelle gravy looks soooo amazing! I am with you on willing and able to finish off that plate!